Mexico City. 14 August 2016. “At some point it will lead to a water shortage” said Vandana Shiva and Sebastiao Pinheiro during their visit to Atenco yesterday. With members of the Peoples Front in Defence of Land (FPDT) they toured the lands of Atenco that the government intends to dispossess in order to be part of the new airport in Mexico City (NAICM). They arrived early in the camp that is located in the area where they intend to build one of the access roads. Vandana, winner of the alternative Nobel prize for the environment, asked Mexicans not to allow life to be exterminated and to come to support the movement of the FPDT and all those who oppose the construction of the airport in these lands. Indigenous Islanders… on What is an aerotropolis? 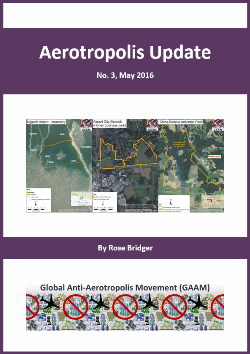 Substantial Victory… on What is an aerotropolis?